One of the many faces in our type collection at the Center for Book Arts is Frederic W. Goudy’s Goudy Old Style. 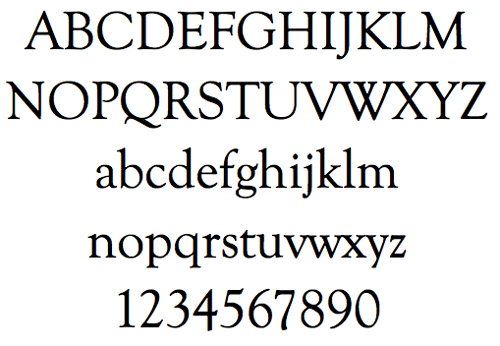 It is one of the most popular typefaces ever produced. Cast starting in 1915 by American Type Founders, it was very widely used in advertising, and in books for chapter headings and titles. You can recognize it best by the diamond shaped dots on i, j and punctuation marks,the upturned ear of the g, and the base of E and L. This face is just one of Goudy’s 100+designs. Do you have a favorite typeface? Would you like us to write about a particular typeface next week? Want to give us suggestions or comments? Comment on this post, email us at info@centerforbookarts.org, visit us on Facebook (/centerforbookarts) or follow us on Twitter (@center4bookarts).